Home › Reviews › How to scan photos? Try Pic Scanner Gold app. Are your memories in a mess? There is an easy solution: Scan photos and old picture albums with iPhone or iPad, using a good photo scanner app. 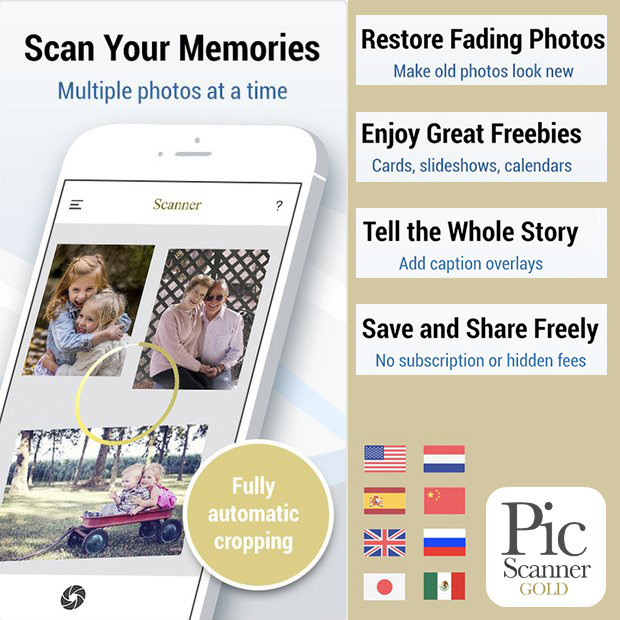 Certified photo organizer, Caroline Gunter, takes an in-depth look at iOS app Pic Scanner Gold. Mobile scanning is very tempting. It’s easy, convenient, and fast – especially for those who don’t already own professional-grade scanning equipment, or for those who don’t want to invest in it. At the time of writing this blog post, there are a huge number of apps on the market that can digitize your photos for you, and most of them are available for less than US$10. That’s a very attractive offer for any family history buff. It’s cheap. Very cheap. Those of us who do this for a living know that, and we certainly understand that professional scanning isn’t an option for every person in the world. So if you aren’t in the mood to plunk out a few hundred (or thousand) dollars for service or a piece of equipment, how about $5.99 for a downloadable app? Sounds good, right? Too good? We’re about to find out! Read Caroline’s full review here. Love it! No learning curve here. There are no big settings to worry about other than quality control, and nothing more to do than scan. If you can take a photo with your iPhone, you can use this app. Easy-peasy! At a $4.99 price tag, it can’t get much cheaper. Less than $5 is crazy cheap for scanning anything, so if you’re not willing to invest this much in your photos, donate them to someone else and defer the job. Your mileage may vary, depending on your phone model and camera. The developer has some great suggestions on how to get better quality scans, so I would highly recommend that you follow that advice if you’re going to use this app. They suggest to put your camera on a locker shelf, which is brilliant! I found it tricky to hold the scanner still enough, so that could become very helpful if you’re doing lots of batches quickly, for example if you’re scanning multiple photos together. Pic Scanner Gold is probably the most feature-rich photo scanner app in the App Store. Click here to download it from Apple’s App Store. Read all about its features here. Pic Scanner is the lite version. It was world’s first photo scanner app for scanning and auto-cropping multiple photos, and adding captions. It also lets you perform basic editing, create albums, and share photos. Pic Scanner is recommended for users with older devices, such as iPhone 5, iPad 3 etc. Click here to download it from Apple’s App Store.